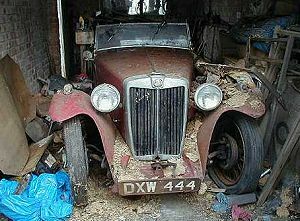 Rogers MG page - Rosy, a restoration project. Debris had fallen on the car during its period of storage, including the chip-board lining of the roof. For anyone who may be interested I am keeping a running log of the project cost up to the present. I have also added notes regarding the quality of service recieved from suppliers and subcontractors.